Contrary to the common perception that potato makes us fat, health experts advocate the combination of a potato juice regimen with healthful meals for losing weight. Potato is considered as one of the forbidden vegetable if you’re on a weight-loss programme. Although potatoes add fat to body only if it is consumed with butter or cream is added. The potato is not that unhealthy as it is considered rather it is low in calories and full of energy. The nutritionally-balanced potato (containing calcium, potassium and beta-carotene) makes us feel satiated after eating. A study conducted at the Arizona State University suggests that potato is a fat-burner; owing to the presence of vitamin C.
Potatoes have resistant starch that slows down the digestion process while contributing to the process of burning down calories. Potato juice after a meal stalls the growth of hunger increasing hormones (leptin and ghrelin). Eating foods that make you feel satisfied is the key to weight loss. Furthermore, potatoes are an excellent source of fibre as well. 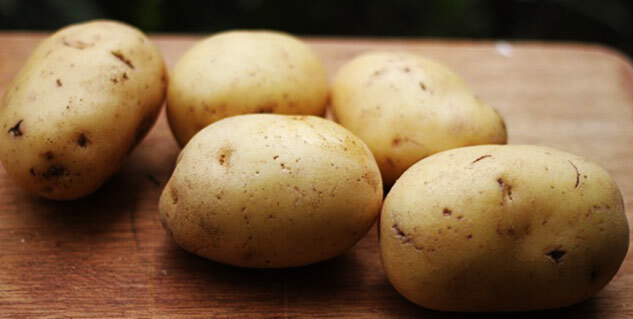 An average-sized potato can fulfil up to 10 per cent of body’s daily requirement of fibre. More importantly, fibre is a non-digestible component that supports elimination of solid waste from the body. It helps to move the fat rapidly through the digestive system for slow absorption, aiding to weight loss. Always take fresh potatoes. They must have firm and brown skin. Take out the ones that are shrivelled, have growing white sprouts on it or the green ones. To prepare the potato juice, put the potatoes into a blender or food processor to liquefy them. Take off the potato’s skin if you feel like, although it is an excellent source of several vitamins. To make it taste better, add a sweetener or honey. Ideally, potato juice gives best benefits when consumed about two-and-a-half hours before eating every breakfast and dinner, although drinking it after meals also has health benefits. Besides consuming potato juice on a regular basis, eating healthy and nutritionally balanced food is very important. Your weight-loss efforts will be in vain if you go for unhealthy foods even while drinking potato juice. In order to avoid any adverse drug interactions and unnecessary complications, it is advisable to talk to your doctor before going on a potato juice diet.